Writing solid SQL queries that perform efficiently is a routine task that relies on finely-calibrated tuning. However, without the right query optimization tool tuning SQL queries can be tricky. For comprehensive Microsoft monitoring, the right query optimizer is a must. In this article, we’re going to look at the best SQL software and query optimization tools. 1 Why do I Need an SQL Server Tuning Tool? Why do I Need an SQL Server Tuning Tool? Tuning SQL server queries is important for optimizing query performance. If queries are running slow or failing, then performance monitoring and SQL tuning can help to make your code more efficient. However, doing this manually without a query optimization tool is difficult because you need to do everything manually with limited functionality. Finding queries that aren’t up to scratch is a painstaking task. Server optimization tools are invaluable because they allow you to view queries with poor performance and locate resource bottlenecks more easily. They also allow you to gather performance statistics which can help to improve SQL queries in the future. Many tools can do this automatically with alerts and automated responses so that queries will be improved without the need for user intervention. Using an SQL server tuning tool helps to improve your server performance and increases your responsiveness to managing server problems. For example, with a SQL monitoring tool, you can tune SQL server queries before you start experiencing performance issues. SQL Tuning – SQL query optimization tools with SQL tuning rewrite SQL statements to improve server performance. Monitor Cloud Databases – Many SQL query optimizers can monitor databases in the cloud. Optimize SQL Queries Online – Optimize SQL queries remotely via your device or web browser. 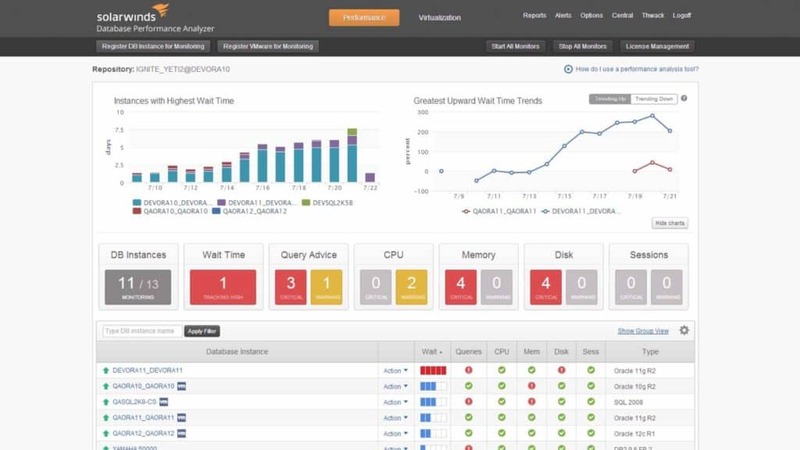 First up on this list we have SolarWinds Database Performance Analyzer. SolarWinds Database Performance Analyzer is a query optimization tool that was built for query performance monitoring and tuning. With this tool, you can monitor the performance of SQLs, Client Machines, Users and Applications through a dashboard. You can view graphs of all these entities to find any larger performance trends. With SolarWinds Database Performance Analyzer, you can monitor databases 24/7 for performance anomalies. Views show data like Top Waits for SQL (Hours) which help to show the state of the network. If your network performance is declining SolarWinds Database Performance Analyzer gives you the heads-up you need to start troubleshooting for a solution. You can use SolarWinds Database Performance Analyzer to monitor the following database types: Azure SQL databases, MySQL, Aurora, ASE, Oracle, MariaDB, and IBM Db2. The status of your database is shown via an overview page which details Wait, Tuning, CPU, memory, and disk status. All of this information is color-coded so that you can see promptly if there is a problem that needs to be addressed. SolarWinds Database Performance Analyzer is an excellent choice for buyers looking for a full-featured SQL query optimization tool that is compatible with other SolarWinds products. SolarWinds Database Performance Analyzer is available from a price of $2,045 (£1,541). There is also a 14-day free trial which you can download below. Second on this list, we have PRTG Network Monitor, a network monitoring tool that offers a diverse database monitoring experience. PRTG Network Monitor can monitor Microsoft SQL, Oracle SQL, MySQL, and PostgreSQL. Monitoring on this tool is achieved through the use of sensors which monitor individual databases. These sensors are preconfigured for each major database so that you don’t have to tweak anything once you start up for the first time. PRTG Network Monitor makes monitoring SQL query optimization easy, and measures how long an SQL query request takes from start to finish. The execution time of the request is then shown on the dashboard so that you can see if there are any problems. In addition, you can also monitor your wider network to identify any performance issues that could have an influence on your databases. The PRTG Network Monitor alerts system helps to make sure that you don’t miss any key information. Once problematic activity is recognized you are sent a notification immediately. Alerts are sent to you via email, SMS, or push notifications on Android, iOS, and Windows Phones. There is also an API that you can use to write your own notification scripts if you want further control over the notifications you request. PRTG Network Monitor is available as both a paid and a free tool. The paid versions of PRTG Network Monitor start from $1600 (£1,206) for 500 sensors and one server installation to $60,000 (£45,237) for unlimited sensors with five server installations. There is also a free trial version available for 30 days. Redgate SQL Monitor is another widely-used query optimization tool. 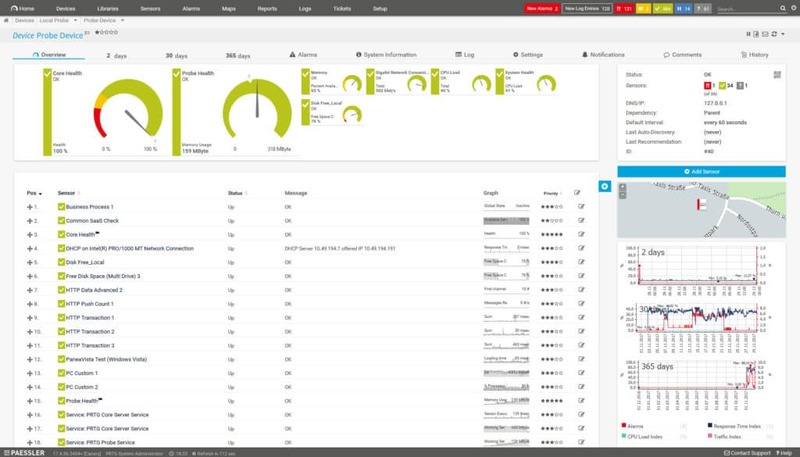 Redgate SQL Monitor adds a state-of-the-art dashboard to help monitor SQL performance. Through the dashboard, you can view an overview of your SQL servers that updates every 15 seconds. In other words, you can easily stay on top of the status of your SQL infrastructure without missing anything important. The instance timeline is particularly useful as it shows you the CPU, Memory, Disk I/O, and Waits of your database. There is also an alerts system to keep you updated on performance changes. Redgate SQL Monitor comes with over 40 customizable templates to warn you about all the common performance issues, whether a query is performing poorly or processes are being blocked. Troubleshooting is another area that Redgate SQL Monitor does remarkably well. Once you discover a performance problem, the platform provides you with additional metrics to help pinpoint the root cause. Metrics can be compared to baseline activity to find what caused the problem. In terms of pricing, Redgate SQL Monitor’s price depends on how many servers you wish to support. Between 1-4 servers the price per server is $1,565 (£1,179). Between 5-9 servers the price is $1,330 (£1,002) per server. If you require over 10 servers then you can contact the company directly for a custom quote. There is also a 14-day free trial which you can download here. EverSQL is an SQL optimizer that is a popular choice for SQL tuning. The tool has a smart algorithm which automatically rewrites SQL queries to make them run faster. Once a query has been rewritten, you can view a code comparison with notes on all changes made to the query. These features combined make it convenient to increase the performance of queries without losing track of what changes have been made. You can also use EverSQL to take indexing recommendations for multiple queries at the same time. Similarly, queries can be optimized directly from the MySQL slow log file. You can also add the schema to view advanced optimization options to further improve performance. 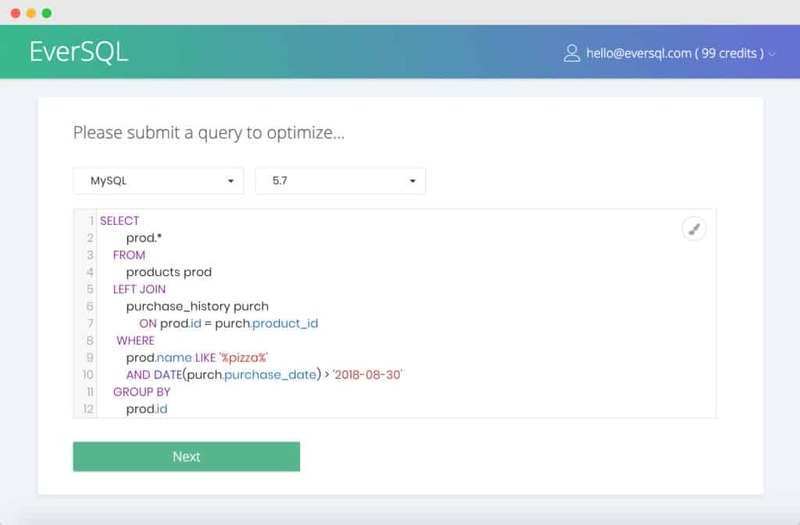 If you want to start optimizing and tuning queries through your web browser at a competitive price, EverSQL is highly recommended. EverSQL is compatible with MySQL, MariaDb, and PerconaDB (EverSQL may work with other database types with varying success). EverSQL Is available for free with 50 query optimizations for 14 days. The Basic version costs $29 (£21.87) a month for 25 queries and the Plus version $135 (£101) for 100 queries. There is also a Premium version which offers a custom number of credits but you need to contact the company directly. You can download the free trial version of EverSQL here. Few tools offer as straightforward an SQL tuning experience as Idera DB Optimizer. With DB Optimizer you can tune SQL on Oracle, SQL Server, DB2 and Sybase. 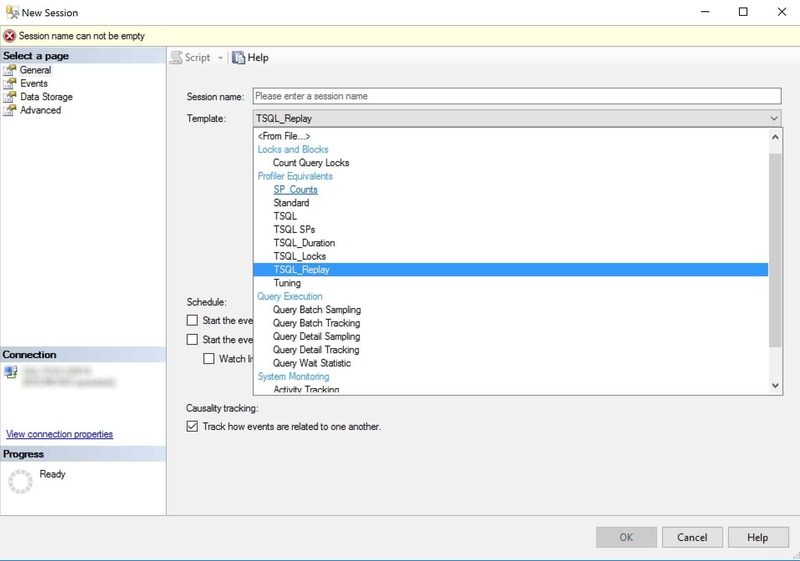 The SQL tuning wizard automatically provides suggestions for tuning an improving SQL code. This ensures that your code performs the best it can. Monitoring for performance bottlenecks is another task that DB Optimizer does very well. You can view a graph of wait-time analysis to view the underlying causes of poor database performance. There is also the option to run SQL queries with alternative execution paths until you find the most efficient SQL statement. Once you find a more efficient alternative you can make the change with one click. Overall DB Optimizer is a SQL tuning tool that is ideal for midsize organizations. DB Optimizer starts at a price of $572 (£431) per user. There is also a 14-day free trial available here. 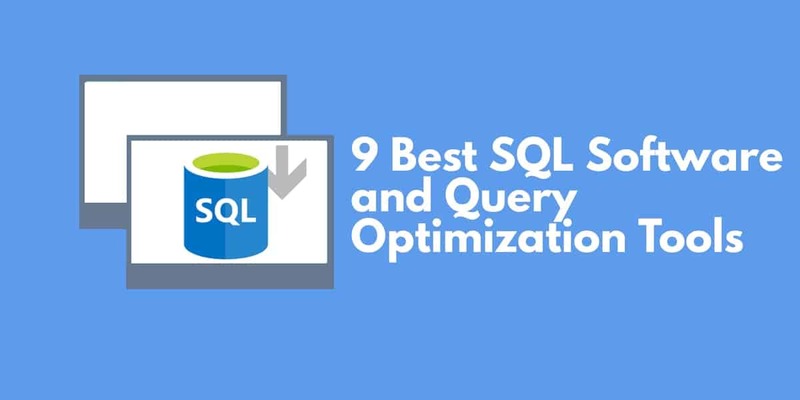 dbForge Studio is one of the top SQL query optimizers on this list. dbForge Studio comes with a range of server management tools to help monitor server performance and tune coding. This tool adds code completion, SQL formatting, SQL snippets, and code navigation to allow you to tune SQL code more easily. One tool that is particularly useful is the Index Manager which monitors SQL indexes and highlights index fragmentation issues. With the Index Manager, you can find databases that aren’t performing well. If you need to transfer data from server to server the Data Compare feature is vital. With Data Compare you can synchronize data from multiple tables, analyze the differences and generate reports. dbForge Studio is thus one of the best tools for data synchronization on this list. There are three versions of dbForge Studio for purchase; the Standard, Professional and Enterprise Versions. The Standard version starts at $249.95 (£188.45) with basic code competition and a visual query builder. The Professional version costs $499.95 (£376.96) with advanced code completion and features like data compare and sync, plus a T-SQL code analyser. The Enterprise version costs $699.95 (£527.76) and comes with Source Control and a T-SQL Unit Test. There is also a free trial version you can download here. SentryOne is a database performance management tool that can comfortably be used for SQL query tuning. With this tool, you can use preconfigured performance baselines to identify resource bottlenecks and other issues. There is also a block detection feature which shows you blocking processes in a hierarchical view. SentryOne also captures deadlocks by finding the process that resulted in a deadlock and identifies the changes you need to make when tuning. The performance analysis capabilities of SentryOne are vast. 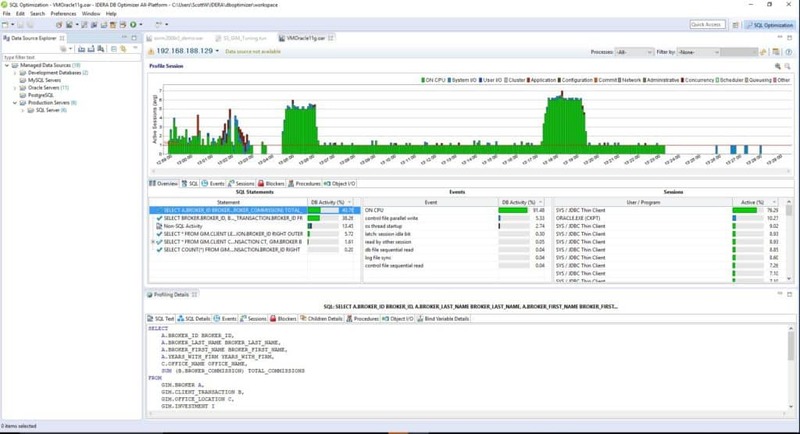 You can monitor SQL server metrics such as: User Connections, Blocked Processes, Batches, Transactions, Compiles, Recompiles, Key Lookups, Forwarded Records, Backup MB/sec, and Send Queue/Redo Queue. You also have numerous metrics to monitor SQL Server Waits with CPU percent of Total Waits, Wait Time by Category, and Wait Time by class. There are also over 100 alert conditions so that you aren’t restricted to manual monitoring. For example, if an SQL query is running slowly the program forwards you an alert. You can even go a step further and set SentryOne to activate a database action the moment a threshold condition has been triggered. The alerts system allows you to automate a substantial proportion of your SQL query optimization management. There are two SQL versions of SentryOne available for purchase: SQL Sentry Essentials and SQL Sentry. A license for SQL Sentry Essentials costs $995 (£750) with a $199 (£150) maintenance fee per year. SQL Sentry costs $2,495 (£1,881) with a maintenance fee of $499 (£376). With the former, you can view performance metrics in real time and with the latter, you benefit from extra features like query analysis and integrated query tuning. There is also a two-week free trial available here. SQL Server Management Studio is a widely-used query optimizer for Windows. On SQL Server Management Studio, monitoring the performance of queries is done through the Database Engine Tuning Advisor or DTA. The DTA is used to make queries run faster. It can add indexes and partition queries to eliminate performance bottlenecks and decrease run time. 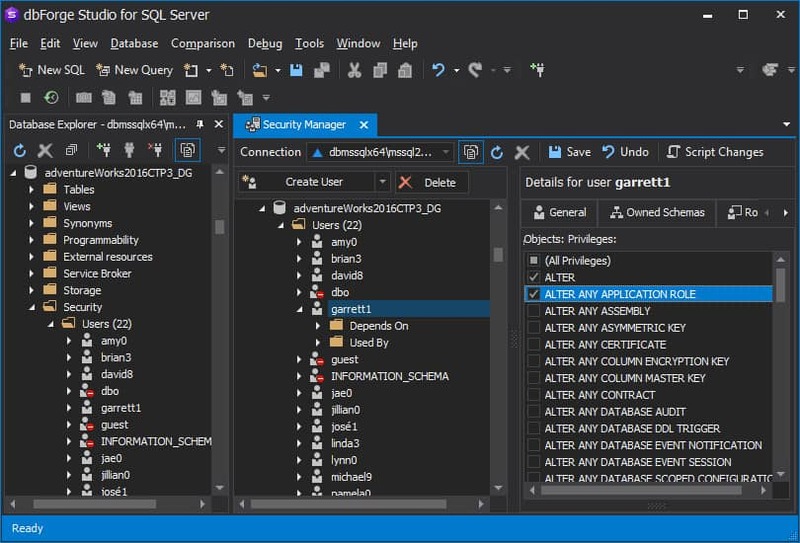 SQL Server Management Studio is available for Windows10, 8, 8.1, 7, 2012, and 2008 R2. If you’re looking for an SQL tuning tool that is easy to use and doesn’t come with a substantial price tag, SQL Server Management Studio is worth considering. SQL Server Management Studio is a tool that is ideal for smaller enterprises on account of its low cost. SQL Server Management is completely free and can be downloaded from the Microsoft website here. Finally, we have ManageEngine SQL Health Monitoring Tools. 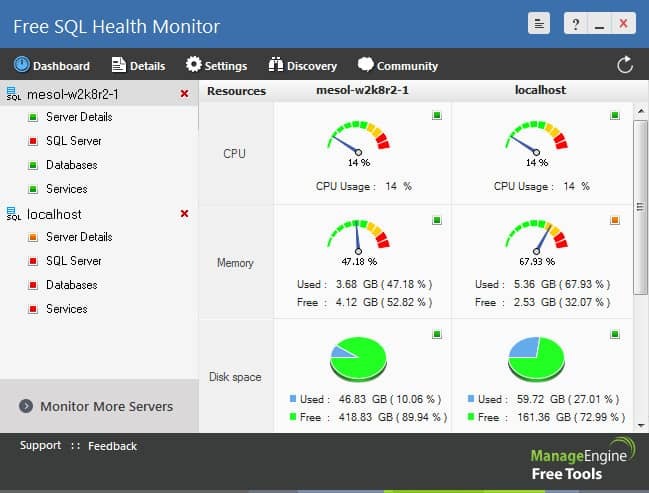 ManageEngine SQL Health Monitoring Tools is a free SQL monitoring platform that can monitor the CPU, memory and disk space utilization of SQL servers. Monitoring SQL servers requires almost no configuration because connected servers are discovered automatically. You can also go a step further and dive down into the database details themselves. For example, you can view the active transactions, log files used, log cache hit ratio, transactions per second and database size. This provides you with the basic information to see if there are any performance issues emerging. If you’re looking for a SQL tool that helps to monitor SQL performance then this is a free tool worth considering. 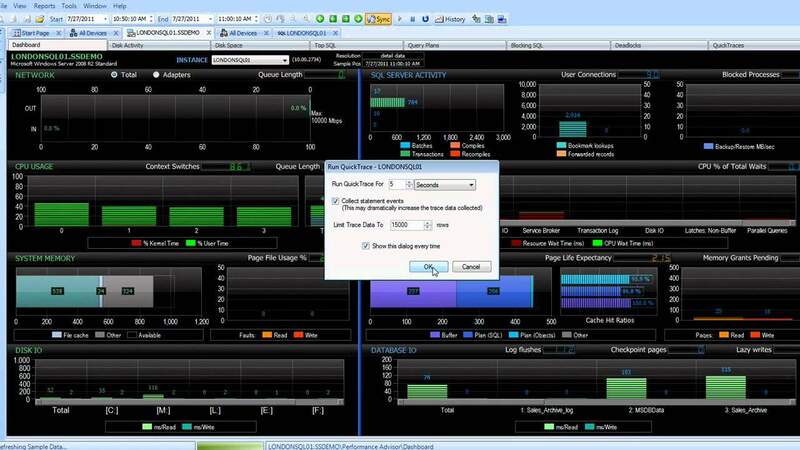 ManageEngine SQL Health Monitoring Tools can be downloaded for free here. If you need to monitor SQL queries as part of your day-to-day workload we highly recommend that you invest in a query optimization tool. Tools like SolarWinds Database Performance Analyzer and SentryOne allow you to keep a watchful eye over SQL query performance to make sure that your servers run efficiently. For those organizations with lower budgets Microsoft SQL Server Management Studio can help you to visualize SQL server performance. Though it isn’t as advanced as some of the other tools on this list, it provides a solid user experience.